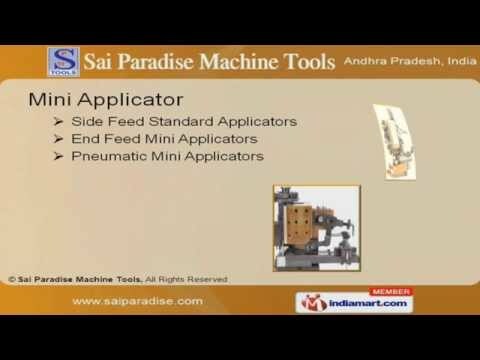 Welcome to Sai Paradise Machine ToolsManufacturer of Crimping, Stripping and Twisting Machines & Equipments for Wire Harness Process An ISO 9001:2000 certified company, established in 1996, at Hyderabad. We have spread our wings to Europe & Middle East, catering to PRICOL, Lumax, Bharat Enterprises & others companies. We are Supported by skilled professionals, Hassle free easy payment options and High grade raw materials. Our product line covers Regular Applicators, Mini Applicator and Crimping MachinesAvailable with us is a vast range of crimping machines that are widely demanded for their high performance and durability. We provide a wide gamut of Mini Applicators that are sturdy in construction and have extremely durable parts with quick dimensional tolerance. We offer an assortment of Motorized Push Pull Load & continuity testers at industry leading prices. Our clients can avail from us a gamut of stripping /cutting & twisting machines that are extremely reliable. Along with that we provide Regular Applicators that are our specialty.